A wind tunnel is a research tool developed to assist with studying the effects of air moving over or around solid objects. The speed and flow of air in a wind tunnel can be measured in any of several ways. For instance, threads can be attached to the surface of study objects to detect flow direction and relative speed of air flow. Alternatively, dye or smoke can be injected upstream into the air stream and the streamlines followed by the dye particles can be photographed as the experiment proceeds. Also, pitot tube probes can be inserted in the air flow to measure static and dynamic air pressure. Sir George Cayley (1773-1857), the 'father of aerodynamics', also used a whirling arm to measure the drag and lift of various airfoils. His whirling arm was five feet long and attained top speeds between ten and 20 feet per second. Armed with test data from the arm, Cayley built a small glider that is believed to have been the first successful heavier-than-air vehicle to carry a man in history. However, the whirling arm does not produce a reliable flow of air impacting the test shape at a normal incidence. Centrifugal forces and the fact that the object is moving in its own wake mean that detailed examination of the airflow is difficult. 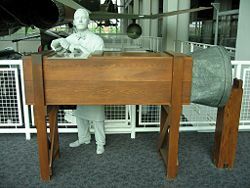 Francis Herbert Wenham (1824-1908), a Council Member of the Aeronautical Society of Great Britain, addressed these issues by inventing, designing and operating the first enclosed wind tunnel in 1871. Once this breakthrough had been achieved, detailed technical data was rapidly extracted by the use of this tool. Wenham and his colleague Browning are credited with many fundamental discoveries, including the measurement of l/d ratios, and the revelation of the beneficial effects of a high aspect ratio. In a classic set of experiments, the Englishman Osborne Reynolds (1842-1912) of the University of Manchester demonstrated that the airflow pattern over a scale model would be the same for the full-scale vehicle if a certain flow parameter were the same in both cases. This factor, now known as the Reynolds Number, is a basic parameter in the description of all fluid-flow situations, including the shapes of flow patterns, the ease of heat transfer, and the onset of turbulence. This comprises the central scientific justification for the use of models in wind tunnels to simulate real-life phenomena. Replica of the Wright brothers' wind tunnel at the Virginia Air and Space Center. The wind tunnel used by German scientists at Peenemünde prior to and during WWII is an interesting example of the difficulties associated with extending the useful range of large wind tunnels. It used some large natural caves which were increased in size by excavation and then sealed to store large volumes of air which could then be routed through the wind tunnels. This innovative approach allowed lab research in high speed regimes and greatly accelerated the rate of advance of Germany's aeronautical engineering efforts. Later research into airflows near or above the speed of sound used a related approach. Metal pressure chambers were used to store high pressure air which was then accelerated through a nozzle designed to provide supersonic flow. The observation or instrumentation chamber was then placed at the proper location in the throat or nozzle for the desired airspeed. 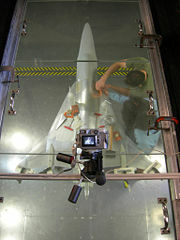 Preparing a model in the Kirsten Wind Tunnel, a subsonic wind tunnel at the University of Washington. 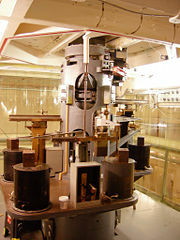 Six-element external balance below the Kirsten Wind Tunnel. The airflow created by the fans that is entering the tunnel is itself highly turbulent due to the fan blade motion, and so is not directly useful for accurate measurements. The air moving through the tunnel needs to be relatively turbulence-free and laminar. To correct this problem, a series of closely-spaced vertical and horizontal air vanes are used to smooth out the turbulent airflow before reaching the subject of the testing. Due to the effects of viscosity, the cross-section of a wind tunnel is typically circular rather than square, because there will be greater flow constriction in the corners of a square tunnel that can make the flow turbulent. A circular tunnel provides a much smoother flow. The inside facing of the tunnel is typically very smooth to reduce surface drag and turbulence that could impact the accuracy of the testing. Even smooth walls induce some drag into the airflow, and so the object being tested is usually kept near the center of the tunnel, with an empty buffer zone between the object and the tunnel walls. Lighting is usually recessed into the circular walls of the tunnel and shines in through windows. If the light were mounted on the inside surface of the tunnel in a conventional manner, the light bulb would generate turbulence as the air blows around it. Simarly, observation is usually done through transparent portholes into the tunnel. Rather than simply being flat discs, these lighting and observation windows may be curved to match the cross-section of the tunnel and further reduce turbulence around the window. The aerodynamic principles of the wind tunnel work equally well for watercraft, except the water is more viscous and so imposes a greater forces on the object being tested. A looping flume is typically used for underwater aquadynamic testing. Air is not always the best test medium to study small-scale aerodynamic principles, due to the speed of the air flow and airfoil movement. A study of fruit fly wings designed to understand how the wings produce lift was performed used a large tank of mineral oil and wings 100 times larger than actual size, in order to slow down the wing beats and make the vortices generated by the insect wings easier to see and understand. ↑ Wind Tunnels NASA. - Frank H. Wenham, inventor of the wind tunnel, 1871, was a fan, driven by a steam engine, propelled air down a 12-ft. (3.7 m) tube to the model. Retrieved March 14, 2008. This page was last modified on 4 August 2013, at 19:25.